Rock Cottage is a 17th Century, traditional, detached cottage that is perched on the rocks above Portmellon beach with stunning sea views from every room, exposed beams, an open plan living area with a cosy fire, and two spacious bedrooms. The owners take great pride in supplying their guests with a perfect, convivial environment, from arrival treats for any guest dogs, home baked welcome cakes and even packing a beach bag just in case you have left something behind! One thing is certain, this will be a memorable holiday destination for all the right reasons! Portmellon is a quiet unspoilt cove with a sandy beach and slipway. It is only a 10 minute walk to the historic fishing port of Mevagissey, a tiny seaside village of small alleyways and traditional buildings, with a selection of restaurants and pubs and shops. Once a busy pilchard port, Mevagissey still has a small fishing fleet but also offers scenic and fishing trips, boat hire and the ferry to Fowey. First Floor: Opens into landing area with door that leads directly onto the road outside. 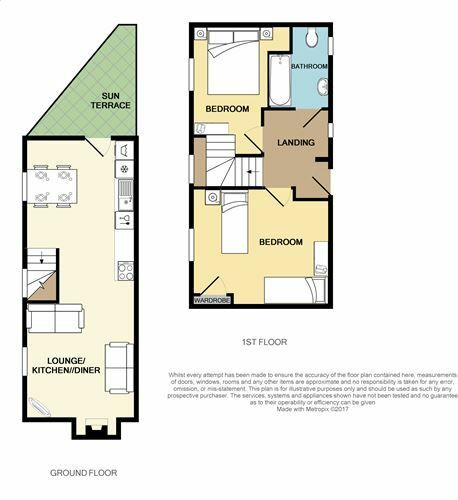 Further doors to; twin bedroom with sea views and storage, master bedroom with sea views and storage, family bathroom with shower over, WC and hand basin. Exterior: South facing sun terrace with seating and magnificent sea views. Heating is via electric night storage heaters and the open fire. The kitchen has a range of equipment. There is an electric oven and hob, dishwasher, microwave, toaster, kettle, fridge / freezer, washing machine and tumble dryer. The sitting room area has a flatscreen, Freeview TV & DVD player. There is an iron & ironing board. Free WiFi is available at the property. Electricity, heating, bed linen, towels and beach towels are all included. Up to two dogs are welcome at the small additional fee of £30 per dog per week, but please note dogs may not be left unattended in the property at any time. Although dogs are accepted at Rock Cottage, they are not allowed on the beach during July, August or September. No smoking is allowed at the property. There is no parking at the property but you can park in the Rising Sun Car park opposite for a small fee or there is on street parking nearby. From Rock Cottage you are only a drive away from King Arthur's seat at Tintagel, or Doc Martin's seat at Port Isaac, or an artist's seat at The Tate in St Ives. But, perhaps the nicest part of our location is that without moving you can just sit within touching distance of the sea, and enjoy the view! Guest from Southfields stayed for 7 nights. Rock Cottage a wonderful Cornish cottage filled with everything and we mean everything you could possibly need. The owners had left fresh eggs from their own chickens and homemade cake. Milk, coffee, tea and sugar also supplied so wonderful after a long journey to just sit and make a drink. Biscuits and blanket left for our little puppy. The cottage was beautifully clean, tidy and in the most fantastic location. A beach bag filled with towels and picnic equipment what a great idea was also left for us to use. The owner was so friendly and helpful, a pleasure to meet. If you are thinking of staying in Portmellon try and book Rock Cottage you won't be dissappointed. A big Thank You for letting us stay in such a wonderful holiday home. WOW! Thank you so much for your lovely comments. A pleasure to meet you and hope to see you again soon. location, relaxing on terrace, local people, beach, host Stuart, welcome pack (especially homemade cake from Mel), facilities, local pub (great meals), everything you need inside property, waking up to sound of sea lapping around you. PERFECTION. Book this wonderful gem now. You wont be disappointed. Guest from Ormskirk stayed for 14 nights. Beautiful Cottage with AMAZING Sea Views! If you want to be close to the sea, Rock cottage is for you! Portmellon is ideal for a quiet relaxing holiday but not too far from the local amenities. The perfect base to explore Cornwall. The cottage itself is beautiful, spotlessly clean and packed with everything you might need on holiday (from beach towels to books to picnic basket!) Would definitely stay again, we are missing the superb sea views out of every window. Thank you so much for taking the time to write such a kind review. We try to make the cottage as we would like to find it, and equip it to make our guests stay easy and pleasurable. We love living in Portmellon and it is great when our guests enjoy visiting us. Guest from Redhill stayed for 7 nights. A beautiful cottage in a fabulous location, if you like your own personal sun terrace with a sea view this is the place for you! Lots to do locally, lovely walks along the clifftop & not far from Eden & Heligan. The cottage has all mod cons required to give you that home from home experience, very comfortable & highly recommended. Many thanks for your fabulous review. We try and put into the cottage with the things we need when we go on holiday, like a beach bag and a properly equipped kitchen. Pleased you enjoyed the location and hope to see you again soon. This beautifully converted barn is in lovely countryside north of Tregony at the gateway to the Roseland Peninsula. A truly superb place to stay, this conversion is centrally heated and double glazed, yet retains its undoubted character, with oak timber floors, exposed stonework, a newly fitted kitchen and bathrooms.